Throwing your kids or teens a summer party and running out of game ideas? Water balloon games to the rescue! Each of the games listed has two variations. You get double the fun for one easy preparation. The only thing you need to do before the party is to buy a large enough supply of water balloons. I recommend you don't buy just any ol' bunch of water balloons. Instead, go for the "Zuru Bunch O Balloons." They come with a special adapter that lets you attach a whole bundle of balloons to your garden hose and fill them all at once. They claim that you can fill a hundred balloons in one minute. 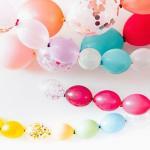 That could be a game in itself… who fills most balloons in one minute? 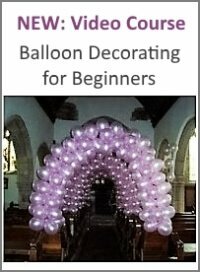 So, what games can you play with balloons? First up, the classic water balloon race. The water balloon race is best played with teams of at least 2 kids each. The more players in each team, the more fun. The goal: run the mapped out course at top speed, but without breaking the water balloon. Map out a course. This can be as simple as running from one end of your garden to the other and back. Or line up some obstacles (toys, buckets, chairs) to turn it into a slalom race. Have several water balloons ready per team at the starting point. Let the runners of each team queue behind the starting line. When you give the sign, the first in each team picks up a water balloon and runs the course. The object is to run the whole course without breaking the balloon. If the kid succeeds, she or he hands the balloon to the next runner of her or his team. What happens if the balloon pops en route? The player must get a new balloon and start over. The first team to complete the course wins. 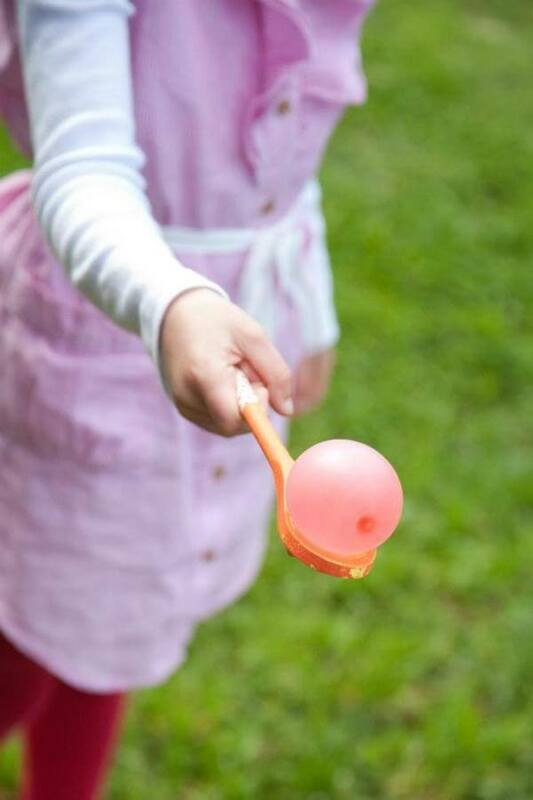 When the kids have finished a round or two of the classic water balloon race, you can turn it up a notch by adding a spoon to the game. 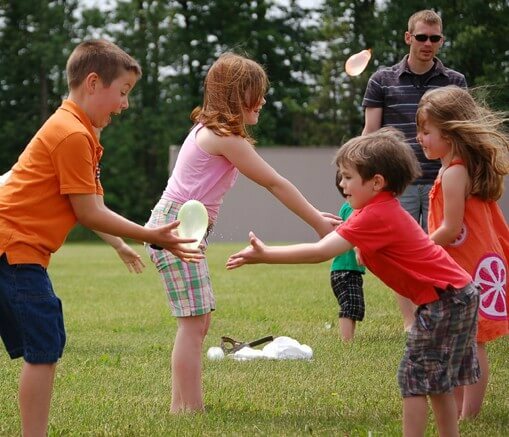 Instead of holding the water balloon in their hands throughout the race, they need to balance it on a large spoon. While the first game was more about speed, this variation challenges the player's patience and sense of balance. This is a super easy game. I can be played individually, or with a partner. All you need are some water balloons. Have the kids toss their balloon up into the air and catch it again. 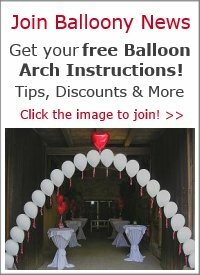 Take a video or photos to "proof" who tossed their balloon the highest! Each kid (or adult) chooses a partner. 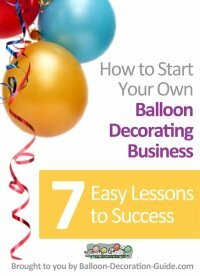 Start by standing close together across from each other and toss the balloon between the two of you. Slowly move further apart with each toss. The pair that can move apart the furthest without popping their water balloon wins. For this variation of the water balloon toss you need at least 4 players and two towels in addition to your water balloon. Two players hold a large towel tight at the ends. Place the balloon onto the towel. The other two players stand a few feet away from the first team, their towel also stretched between them. The first team now throws the water balloon with their towel up into the air and towards the other team, who try to catch the balloon with their towel. It's not as easy as it sounds. It takes some practice and is more suited for older kids or their parents. 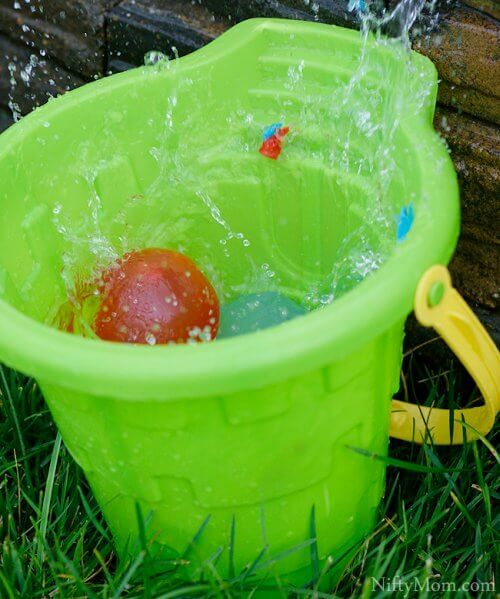 Another simple water balloon game that challenges and improves your aim. Place two same sized plastic buckets in a row, a few feet apart from each other. Fill a good number of water balloons and place them next to the "starting" line, about 10 feet (3 m) away from the buckets. You'll also need a stopwatch (every smart phone usually has an app pre-installed). There are always two players who compete against each other. Each player gets the same amount of balloons and has got one minute of time to try and throw their balloons into their bucket. The goal is to not just land the balloons in the bucket, but also to burst them to have the fullest bucket (with water) at the end of the one minute. Played just like the game above, but now the goal is to land as many balloons as possible in the bucket without bursting them. This variation requires good aim paired with a gentle throw. That's one of those water balloon games where you will definitely get wet. I recommend you play it in bathing suit or shorts and old t-shirt! You need at least 2 pairs of players and several water balloons. If you want to upgrade the difficulty level of the game, you can fill a regular 9 or 11 inch latex balloon with water. Two players stand back to back and place the water balloon (or regular water filled balloon) between their backs. They can interlace their arms to get a better hold of each other. The goal is to pop the balloon as fast as possible. The couple who pops their balloon first, wins. Told you you'd get wet with this game! Instead of popping the balloon between their backs, the players have to try not to pop the water balloon while they race from start to finish line. You've still got your race course set up from the very first game, right? If not, just mark start and finish line with a rope. If you have more than 4 people, divide them into two teams. As soon as one couple reaches the finish line - with the intact water balloon between their backs - the next couple starts. If the balloon pops, the player pair has to go back to the start line, pick up a new balloon, and race again. 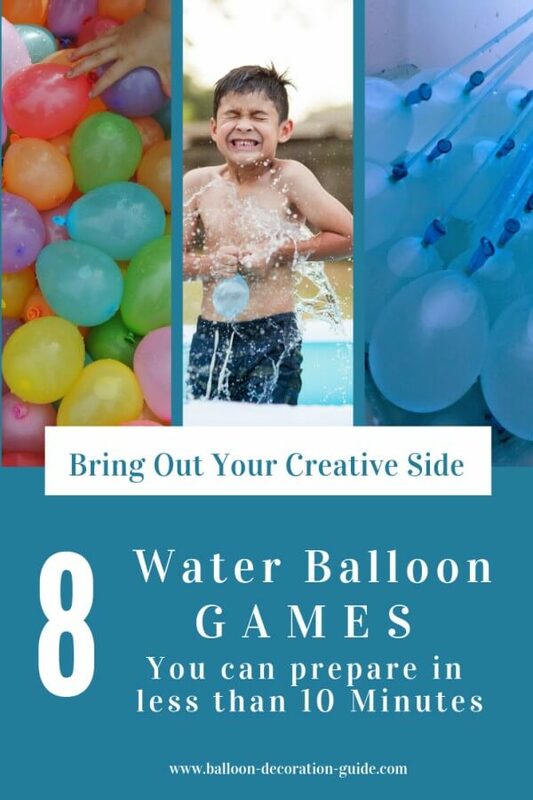 That brings us to the end of our fun list of super simple water balloon games that you can prepare in less than 10 minutes. Before you get started, watch this video for some great tips how to best fill these pre-prepared water balloons. It's actually a review between two brands. But it seems that the "Easy Einstein" balloons aren't being sold anymore, only the "Bunch O Balloons" (which, luckily, did a bit better in that review anyway!). Check out other "Hits for Kids"